What Are Smoke Curtains and How Do They Work? Fire safety systems are a necessary and important feature for every building. While annual fire safety inspections show that your building meets local safety codes, these inspections only ensure that minimum requirements are met. Even with a passing grade, there are ways you can further protect your building and its occupants. There are three main elements of a fire safety system: detection, notification and response. The typical building will have equipment in place to detect smoke and heat, as well as notify building occupants. Most buildings will have a basic water sprinkler system in place that will be automatically activated when a fire is sensed (the response element). There may also be fire hoses located in the building to allow for more efficient fire extinguishing. However, for a more effective response element to your safety system, you should also include smoke curtains in your building. Water sprinkler systems and other response equipment are built to extinguish flames. This works well for protecting the building itself but leaves room for improvement when it comes to protecting human health. According to statistics from the National Fire Protection Association (NFPA), smoke inhalation is more likely to be the cause of death than the fire itself (i.e. burns). An estimated 40% to 50% of fatalities occurred solely from smoke inhalation. To prevent injury to building occupants during a fire, you need to protect them from smoke inhalation as well as from the actual flames. Smoke curtains are the ideal solution for smoke control. You can easily install them into existing buildings, and they work with other detection and response systems already in place. Unlike other smoke control equipment such as outdoor exhaust vents, smoke curtains provide a physical barrier against smoke. When deployed, the smoke curtain will deploy vertically from its housing located in the ceiling. These curtains can seal off doorways and elevators, and they can even form an independent perimeter around staircases and atriums where no walls are present. There are several styles of smoke curtains, making them the right choice for building owners who want the control smoke in the most effective way possible. 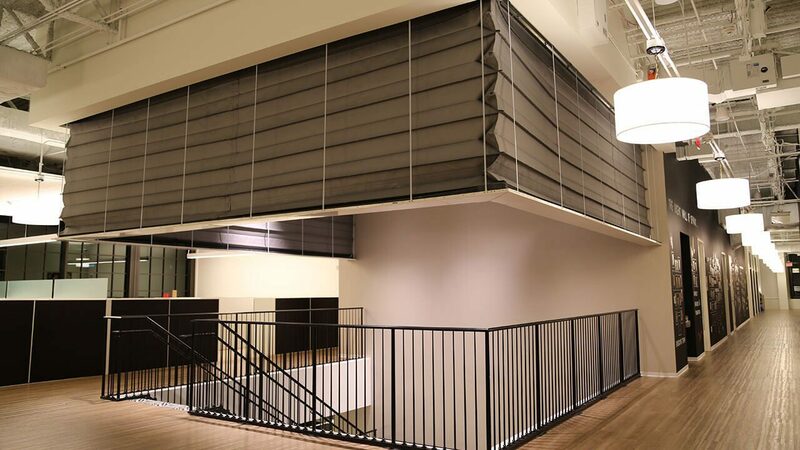 There are four main styles of smoke curtains: Elevator, Vertical, Draft and Perimeter. 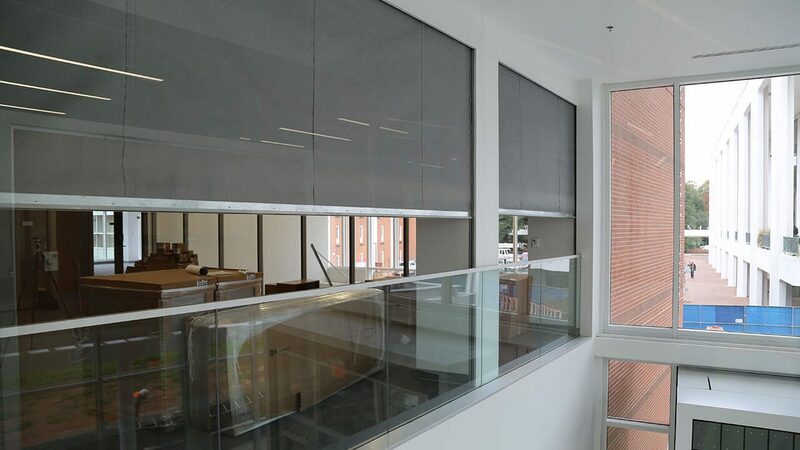 Each style of curtain is compatible with other fire safety systems and can be installed to automatically deploy when a fire or smoke sensor is tripped. 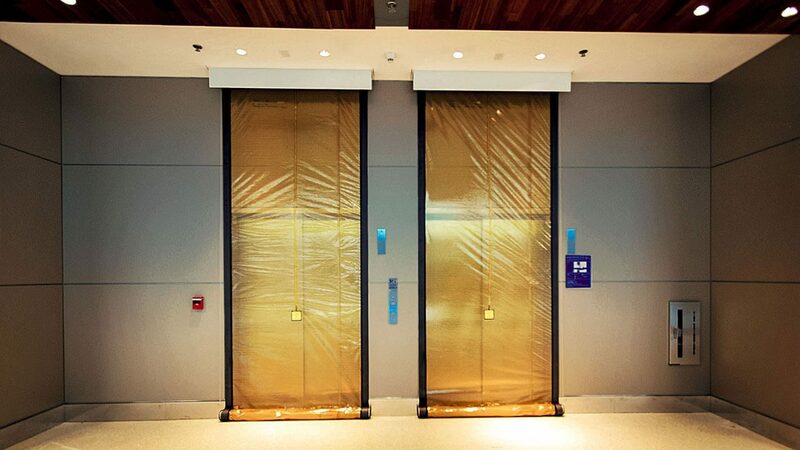 Elevator smoke curtains perform the vital function of blocking smoke from entering and exiting through elevator doors. Elevator shafts cause air to be pulled upwards through to the roof of the building. In the event of a fire, this can cause smoke to spread quickly to other floors of the building. Most fire codes require some type of smoke barrier over elevator doors. Smoke Guard’s elevator smoke curtains will meet or exceed this requirement and help keep building occupants safe. Vertical smoke curtains are typically used to close off openings from standard doorways to larger atriums. They are located within the ceiling above the opening and are deployed downwards to prevent smoke from spreading through the building. These curtains help to divide the building into smaller spaces and contain smoke to individual rooms. This allows occupants to evacuate more easily and firefighters to more quickly enter the building. Draft curtains are a type of static curtain that is most often placed in warehouses or manufacturing environments. Typical buildings, such as office and retail buildings, probably won't find draft curtains necessary, but those with expansive, open facilities with high ceilings should consider them. This type of curtain doesn't form a total barricade against smoke but instead breaks up the airflow along the ceiling. They should be strategically placed near exhaust vents to slow down the travel of the smoke and push it outwards through the vents. If your building has large open staircases or escalators, perimeter curtains are an ideal solution for containing smoke. They function similar to vertical curtains, but instead of blocking off one entryway, they form a totally independent perimeter, requiring no walls or corner posts to be present. Although perimeter curtains are designed specifically to slow flames, they will help to slow the movement of smoke as well. 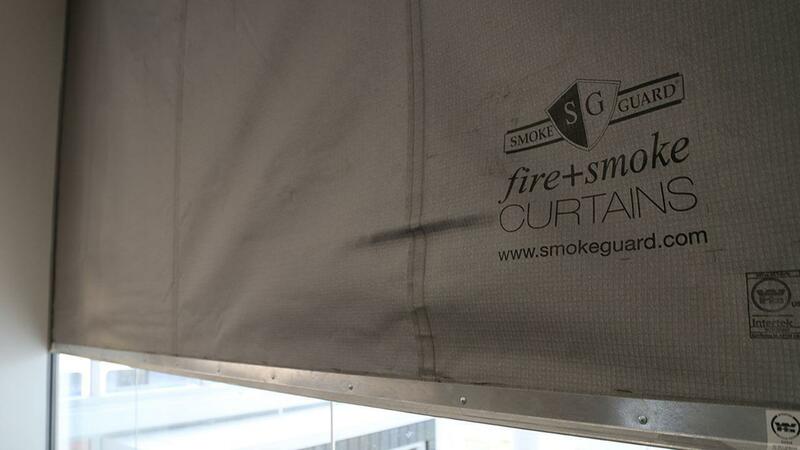 Smoke curtains are simple to install and use. They are highly effective at protecting occupants from smoke inhalation and reducing smoke and heat damage to the building itself. For more information on how smoke curtains can help protect your business, contact a representative at Smoke Guard today.